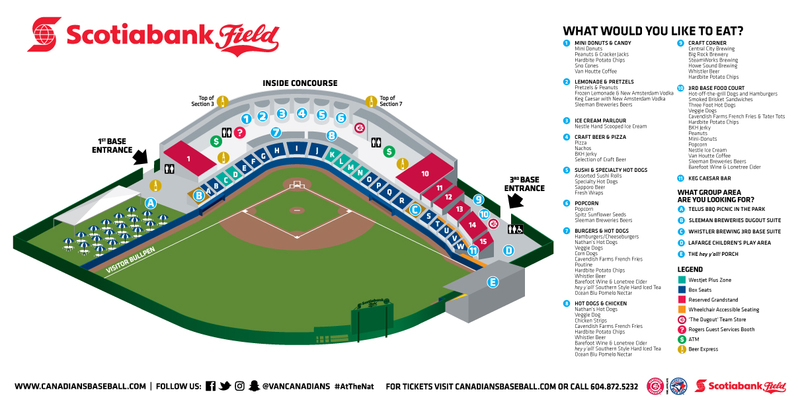 Scotiabank Field at Nat Bailey Stadium is Vancouver's most unforgettable summertime setting to host your next event. Whether you are looking to entertain anywhere from 20 to 400 guests, the Canadians have a group package perfect for those important to your business. Our dedicated C's staff are here to help every step of the way. Full payment, either by credit card or within 21 days of invoice by cheque, is required to secure your game date. Please refer to Group Payment, Policies and Procedures or Frequently Asked Questions for more information. To secure your reservation, either a 50% non-refundable deposit or full payment for the minimum group size of 30 (whichever is greater) is required within 21 days of booking - or your reservation will be released. Please refer to Group Payment, Policies and Procedures or Frequently Asked Questions for more information. To secure your reservation, either a 50% non-refundable deposit or full payment for the minimum group size of 20 (whichever is greater) is required within 21 days of booking - or your reservation will be released. Please refer to Group Payment, Policies and Procedures or Frequently Asked Questions for more information.